This is the first in a three-article series on labor conditions in Bangladesh by Larry Luxner, a freelance journalist based in the Washington, D.C., area. Luxner spent 11 days in Bangladesh earlier this year as a guest of the country’s Ministry of Foreign Affairs. To read the entire series click here. CHITTAGONG, Bangladesh — Late last month, 111 factory workers burned to death in a fire at Tazreen Fashions, a nine-story garment plant on the outskirts of Dhaka. The Nov. 24 tragedy — since ruled a case of arson — briefly made Bangladesh prime-time news and enraged human rights groups that have long called this overcrowded South Asian country the world’s biggest sweatshop. 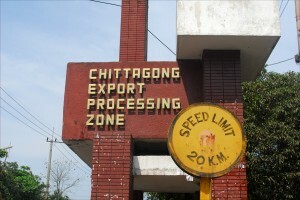 Entrance to the Chittagong Export Processing Zone, one of the world’s first EPZs. More than 100 companies have factories in this zone, taking advantage of rock-bottom wages to produce textiles, apparel, electronics and other items for a hungry world market. Yet talking to Suvashish Bose, vice-chairman of the government-run Export Promotion Bureau, you’d almost think you were in Switzerland. Oh yes. During a trip to the Chittagong Export Processing Zone earlier this year, this reporter tried to mingle with hundreds of such “happy” workers, but was prevented from doing so. The massive industrial park — home to hundreds of factories churning out products for Nike, Reebok, JC Penney, Gap, Walmart, Kmart, Wrangler and Tommy Hilfiger — is located on the outskirts of Chittagong, a teeming port city whose four million inhabitants make it the second-largest metropolis in Bangladesh after Dhaka. Organizational chart is displayed on the wall of the Korean-owned YoungOne factory in Chittagong, Bangladesh. Labor unions at the Chittagong Export Processing Zone are strictly prohibited. Our 12-member press delegation, invited by the country’s Ministry of Foreign Affairs to publicize economic development in Bangladesh, included print journalists from the United States, South Korea, Japan, Great Britain and Belgium, and TV crews from as far away as Kenya, Greece and Uzbekistan. We were warmly welcomed by S.M. Abdur Rashid, general manager of the Chittagong EPZ. He showed a 15-minute promotional video from the Bangladesh Export Processing Authority, and followed that with a briefing about the EPZ itself. The zones together employ 324,000 Bangladeshis — 64 percent of them women — and Chittagong’s EPZ is by far the biggest. Rashid said 225 of the factories here are foreign-owned (from 37 countries), while another 63 are joint ventures and the remaining 113 are purely local investments. One more thing prospective investors considering Bangladesh can count on: no pesky trade unions to make trouble. Young Bangladeshi woman stitches fabric at the Korean-owned YoungOne factory in the sprawling Chittagong Export Processing Zone. That’s helped make this country the world’s second leading exporter of apparel after China — though it’s also infuriated American groups like the AFL-CIO, which is now trying to get the Obama administration to revoke trade preferences for Bangladesh. When it came time for questions, we asked Rashid why the Chittagong EPZ expressly forbids the establishment of unions — a situation that would be illegal in most other countries. The free-zone boss looked genuinely puzzled. Of course they don’t. Unions that had any real teeth might demand better salaries for their rank-and-file members than the $48 average free-zone wage now in effect. At $1.50 a day, that means Bangladeshis are the lowest-paid workers on Earth. On the other hand, said Rashid, it also makes Bangladesh more competitive than any of its Asian competitors: Pakistan (with average factory wages of $80 a month); Vietnam ($84); India ($109), Malaysia ($132), Indonesia ($135) and China ($250). After the briefing, EPZ officials took us on a highly orchestrated tour of the Youngone footwear plant, one of 11 the Korean conglomerate operates in Chittagong. The plant manager, identified only as Mr. Shahin, said 85 percent of the 3,500 workers in this particular factory are women. They make 14,000 pairs of shoes a day — or more than five million a year — on contract for Nike, North Face, Timberland and L.L. Bean, among other buyers. Bangladeshi women assemble sneakers at the Korean-owned YoungOne factory in the sprawling Chittagong Export Processing Zone. Yet a stubborn female supervisor tried to discourage us from photographing the workers — even going so far as to physically position herself between our cameras and the factory floor. We were also ordered not to take pictures of crates or boxes that would identify U.S. customers, though many in our group secretly did just that. What exactly were these factory bosses trying to hide? Earlier this week, a high-level investigation concluded that the Nov. 24 disaster at Tazreen Fashions — one of the worst fires in the history of Bangladesh — was a case of sabotage; supervisors apparently told the women working at their sewing machines that the whole thing was a drill and padlocked the exits to prevent anyone from escaping. But even before the horrific blaze, activists at home and abroad had accused for years accused Bangladesh’s apparel export industry of paying its workers slave wages while maximizing profits at all costs — accusations local officials here dismissed as preposterous. Not one official during our visit to Chittagong mentioned the fact that in December 2010, thousands of workers attacked factories in a dispute over poor wages and working conditions. Police responded with live bullets and tear gas; three people were killed in the riots, which led Youngone to temporarily close all its factories. It was those demonstrations, in fact, which forced Prime Minister Sheikh Hasina to raise the minimum wage to its current $37 a month, not including overtime and bonuses; it had been only $21 a month prior to the protests. Jef Van Hecken, a Belgian adviser to the Dhaka-based National Federation of Garment Workers, said any worker who tries to organize a union is dismissed. “There’s real harassment and death threats,” he said, pointing to the April 4 disappearance of labor organizer Aminul Islam. His body was later discovered, with signs he had been tortured, yet nearly nine months after his murder, no arrests have been made. 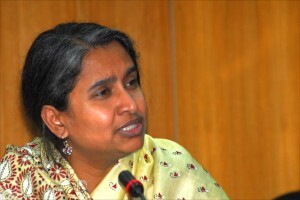 Dipu Moni, a well-known politician and the current foreign minister of Bangladesh. Shamarukh Mohiuddin, executive director of the Washington-based U.S. Bangladesh Advisory Council, said that as long as there’s a pool of workers willing to labor for dirt-poor wages, employers don’t have much of an incentive to change course. In 2010, Bangladesh raised the minimum wage by 87 percent, said Mohiuddin, but it still remains a “least developed country” with about 70 million of its 158 million inhabitants living below the poverty line. During an interview in Dhaka, the country’s foreign minister, Dr. Dipu Moni, tried to put the issue into perspective. Very well-written series that shed a necessary light on these deplorable conditions. If more people speak up, maybe something will change for these poor people. Great article that provides a very good picture of the nuances of the issue. I enjoyed these articles. Is like reading fiction about the horrors of savage capitalism, and Bangladesh a paradise for exploiters, traitors and mysogynists. Thank you for such well written stories and brave reporting. My heart goes out to all the people having to work for such greedy companies who think humans beings are ‘adaptable’, ‘trainable’ and happy making meager wages. Luxner did a great reporting job on this story. I cannot wait to see the next installment. It’s one thing to read an AP story that’s probably been cut and sanitized, and another to actually have a canny reporter on the ground. So Nice Article about Bangladesh. Like it & Thnx a lot for ur Positive Viev abt Bangladesh. Nice article. As i wear my Indonesian sewn shorts.